It's a challenge keeping up with the thoughts of Peter Hancock, a pioneering researcher in cognitive engineering and human performance. His work combines philosophy, invention, and the study of human factors to help improve everything from highway construction to customer service. Early in the HIV/AIDS crisis, he helped design a needle with a protective sheath to lessen the chance of disease transmission to healthcare workers. He's advised on new cardiac pacemakers that can literally give instructions to passersby if their owners are suddenly incapacitated. And that's just the start. The British native and AAAS Fellow currently teaches psychology and conducts research at the University of Central Florida in Orlando where he focuses on human interaction with technology. Quoting Henry David Thoreau, he says, \We have become the tools of our tools." Hancock came to the United States from the UK to study, he says, once he realized that his rugby moves and focus on physical education were unlikely to result in a lasting career. His advisor at the University of Illinois Urbana-Champaign gave him a wide berth in choosing what to study. "I realized that the levers that move our world are almost all technical these days, " he said. Much of his recent research has centered on ergonomics and user-interfaces with vehicles. But his wide-ranging intellect soon goes off-road as his comments about safety, stress and performance broaden to include Shakespeare, labor law, life on Mars—and a robot revolution. "Part of experimental psychology is taking a lot of the insights you get from neuroscience and direct empirical observations categorized as experimental, then extrapolating those into the real world. So, I study people a lot," he said. Cognitive engineering helps humans and machines mesh from the earliest stage of any project, to maximize safety and productivity, as tools play larger, more constant roles in our lives. Hancock has published prolifically about these interfaces, including the book, "Mind, Machine, and Morality, Toward a Philosophy of Human-Technology Symbiosis, "
One incentive for Hancock's merging of the work of neuroscientists, engineers and computer experts is to help increase the number of people whose lives can be improved. "We don't see that the benefits of technology that are given to the human race are equally distributed," he observed. Of his transportation studies, he says, in recent years vast improvements have been made in aircraft, ships and cars. Therefore, as these machines are made more reliable, it's the human decisions that must come under the spotlight in understanding work-related injuries. "We want things to be as routine and predictable as possible, especially in high-risk areas," he said. "From industrial production control, to transportation, all those things are routinized in order to try to minimize the uncertainty." 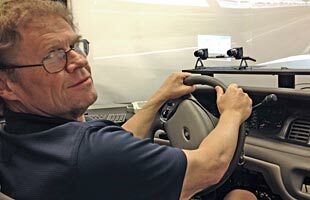 Hancock has used sophisticated driving simulators to study traffic safety and design, and to study accident avoidance responses in collisions. "In my lab in Minnesota, we actually designed roadways in virtual reality first, so that people didn't have to drive them to discover the potential flaws in them," he said. Right now, his team is looking at the impact of new technology behind the wheel—what happens when drivers wear "Google Glass, a head-mounted, vocally commanded computer while driving? The research, a partnership with UCF and Air Force Research Laboratories, may help in developing legislation about wearable devices that ease driving distractions, and those that make driving more dangerous. Hancock also studies Unmanned Aerial Vehicles (drones) and robots—technologies that blur the lines between where the human ends and the machine begins. He's interested in the interfaces that connect the two—things like, how people see what the UAV is seeing and how they can be made aware of other things that the UAV currently isn't seeing. Those answers could reduce the possibility of civilian deaths when drones are used by the military for combat missions. Hancock's MIT2 Laboratory ("Minds in Technology, Machines in Thought")—located at UCF—is actively involved in the evolution of human-robot interaction, whether on the battlefield or an assembly line. His work spans applications that treat 'bots as simple tools, to ones engaging them as "active, sentient teammates." Too much trust can lead to overreliance and complacency, while too little trust can mean a lack of use, he says. As the use of robots moves into widespread use, such as health care, non-scientists will need to learn how to relate to them. "We can't turn off the machine anymore," he said. "Now we have to learn to guide it in an intentional fashion." Hancock was named Pegasus Professor at UCF in 2009, the highest academic honor at the university. He was also selected for Trustee Chair Professorship, based on his record of accomplishments in teaching, research, and service. Whether he is focusing on a pilot's mental fatigue in the cockpit, or a teenager texting behind the wheel, Hancock is gaining ground in understanding the blending of our brains with the machines we are constantly refining. "Human beings are information-foraging animals," he says. "Information has become the cognitive cocaine of the new century."